Today's custard square review (I promise the next post will not be related to custard in any way, in case you're getting sick of it) comes to us from across the ditch. 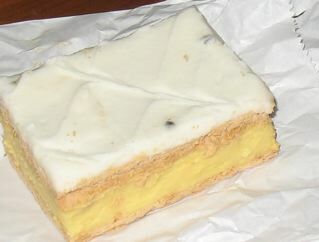 My good friend Liz, who lives in Brisbane, emailed me her review of her best local offering - though they tend to call them vanilla slice across the ditch (and is the Aussie version always topped with passionfruit icing? I know some places here do that but wonder if that's the Aussie twist). If you're ever in Brisbane and get a hankering - now you know where to go! Its not often that me and my custard square get a quiet moment alone to muse on its deliciousness and do a photo shoot all at the same time, but today is the day. After swimming this morning we ventured to the bakery - mainly 'cause we were out of bread and needed some for lunch. Elissa who is a massive fan of ‘treats’ was with me and of course the moment we walked in the door requested a treat. I’m sure some mothers would cringe at this... I secretly hope she will ask 'cause it means I can justify purchasing myself a piece of ‘vanilla slice’ - I have asked for custard square on countless occasions but all I get is blank looks. As you probably know I’m a pretty big fan of the old vanilla slice from our local bakery (Bellmere Bakery) so today's slice has high expectations. It is of generous size, the custard is sweet and very delish! but could be a little creamier. The passionfruit icing is just thick enough and is yum yum yummy! The pastry today perhaps lets it down a little it is soft, I like it with a bit more of a ‘crunch’ to it. All in all I’d probably give today's piece a 7.5 out of ten. So now I’m going to sit back, Facebook, read your timtam truffle posy idea. I like it and really might just steal it for a small Christmas gift for the zillions of aunts and uncles. Elissa might even enjoy dipping stuff in chocolate (guarantee ours won’t look as beautiful as yours!!). Sip my tea.... Mmmm tea the perfect accompaniment. 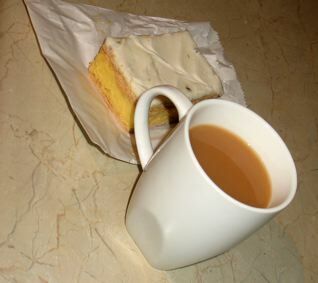 I love that Liz hopes her daughter will ask for a treat - that sounds like a great excuse for a sneaky custard square! Do you have any guilty secrets like that?